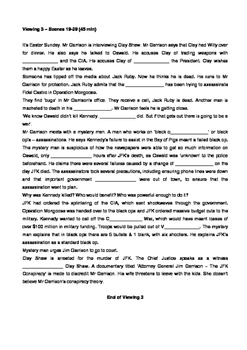 This is a 4 page annotated student worksheet for the movie, JFK, by Oliver Stone. Starring Kevin Costner, Kevin Bacon and Tommy Lee Jones. 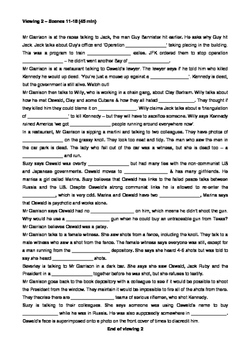 This worksheet accompanies the movie JFK, which is viewed over 4 class sessions. 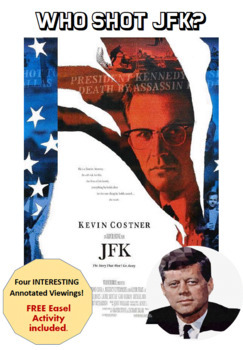 Topics addressed in this film include JFK's assassination and the conspiracy behind his murder, black rights, the Cuban missile crisis and life and civil rights in the USA during the 1950's. This series of worksheets will set your students up for a whole week of viewing, and is an engaging way to introduce 1950's USA. 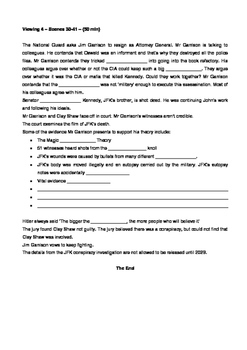 This worksheet accompanies the assessment "JFK - The Assassination" and fits in with the Yr 10 Australian Curriculum re: Civil Rights unit.